Doreen Gay Kassel lets loose with some torn polymer and vivid color experiments. She rips and tears with an abandon that’s refreshing. I’m guessing that Doreen is giving herself some playtime after months of hard work including her feature on the cover of Cloth Paper Scissors. 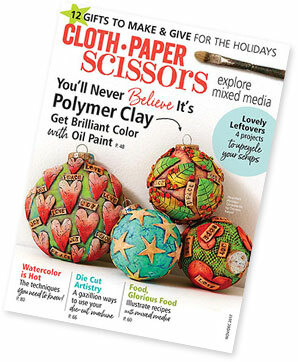 The November/December issue is dedicated to creating gifts with meaning and you can preview it here. If you want to know what other artists are trying and how they chug through the winter doldrums, join us at StudioMojo on Saturday morning.